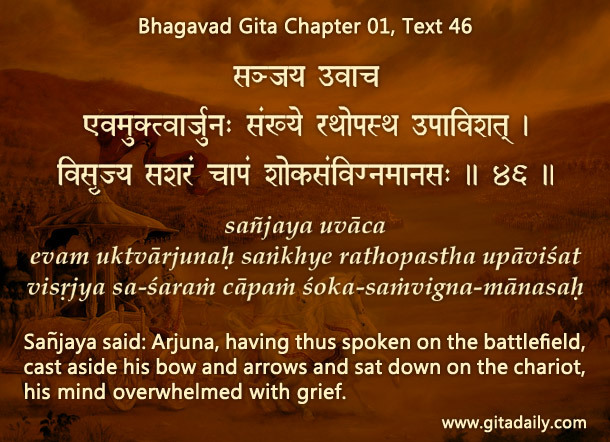 The Bhagavad-gita’s dramatic setting depicts the greatest archer of the times, Arjuna, on the verge of fighting the greatest war of his life on the battlefield of Kurukshetra. Yet at that momentous moment, he loses his will to fight, as indicated by his putting aside his bow (01.46). For a warrior to chicken out before any fight is unbearably disgraceful. And for a champion warrior to lose his nerve just before the biggest fight of his life is inconceivable. If anyone had told Arjuna to put aside his bow, he would have been infuriated. But because that suggestion came from inside, it became not infuriating but overwhelming. We all are vulnerable to be misled by others, but we are much more vulnerable to be misled from inside. The Gita demonstrates this devastating deluding power of our mind. In our daily life, we all have to fight against hostile situations. If we let the mind’s negativity get to us, we too will lose the fight even before it begins. The Gita’s message can equip us internally in two ways. Firstly, with the knowledge of the existence of the inner enemy. Secondly, with the weapon of spiritual knowledge: the knowledge that we are at our core spiritual and indestructible, and are parts of the whole, Krishna who is spiritual and indestructible, and ultimately infallible. No matter how grim the situation, Gita wisdom helps us look up from the situation to Krishna, and prayerfully contemplate how best we can serve him in that situation and through that situation. By such prayerful contemplation, the mind’s grip on us loosens and we can find the will to continue the fight. And eventually, as the Gita’s message did for Arjuna (18.78), we will be guided by Krishna’ grace towards inner clarity and outer victory. These words of courage and wisdom should be our partners and guides in all situations in our lives . Lest we forget – these are all mind games and one has to be aware and conscious to get past the wily games that the mind plays ..